Girls, we get it — we've all grown up watching Bollywood movies and love those elaborate Manish Malhotra lehengas or desire to look like a true Sabyasachi bride. Getting them on a shoestring budget can be tricky, but thanks to several labels or online shopping sites that are designing elegant lehengas for us to slay at a friend's wedding or our own. So, here's a list of lehengas that you can shop from to look like a Bollywood diva. Want to nail Alia Bhatt's look from Badrinath Ki Dulhania? Check out this green and yellow lehenga that comes with minimal and elegant gota patti work. It is paired with a Bandhej dupatta, which keeps you sassy but only with a hint of a girl next door look. We've been hoarding from The Wedding Brigade for quite a bit of time now and enjoy the accessories and clothing because they don't burn a hole in our pocket, and at INR 9,600, this one's a steal. 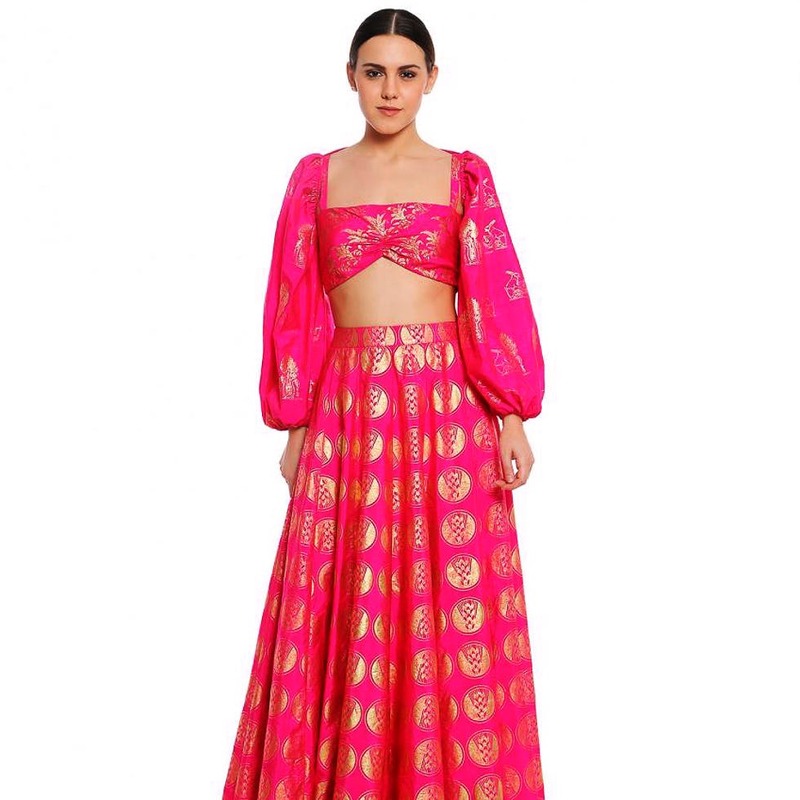 If you have envied Kareena Kapoor's sense of style and wanted to dab some of it on yourself, this Hot Pink Shrug Lehenga by Masaba Gupta is an answer to all your prayers. Whether you're looking for an outfit for sangeet or mehendi, this embroidered lehenga will make you stand out, fo sho! This Banaras Silk lehenga set is quite flowing and comes with a can-can that helps you maintain that bouncy flow. We love how rich the colour is. The pink blouse, although simple, keeps the entire outfit stunning, and since the dupatta is tiny, we recommend getting a different dupatta to match it. Neerus has the same outfit in different colours as well, that you can grab from the outlet. If you have fancied Anushka Sharma's lehenga in her Manyavar advertisement with Virat Kohli, you can grab the very piece from Manyavar. This maroon lehenga is embroidered throughout and the chiffon dupatta adds a feminine touch to it. At INR 32,999, we know it's price a bit high, but it's entirely worth it. If you are looking beyond reds and maroons for a change, this green ready-to-wear lehenga is perfect. It is simple, it's classy, and it's pocket-friendly. Plus, it comes with a lovely golden dupatta that you can drape as a half-saree too. If you are the bride's sister or the bridesmaid and looking for a subtle coloured lehenga that's not too heavy, this pink chequered lehenga from Koskii is the boss! The crop top has floral clusters, and although the entire set is simple, slaying in this outfit is easy because it's that pretty!